Windows 10 is the latest OS which contains many new changes in compare of its previous one, to which its user are unknown and he can't imagine that it also happens. 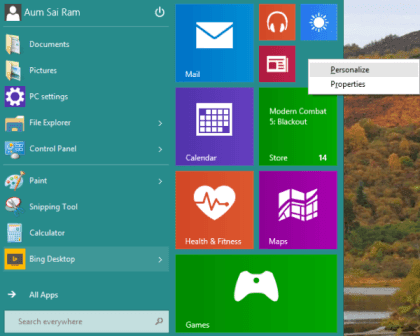 Such a new change is here Set desire color and Size of Start Menu including color intensity and mixer. Tips to perform this task is available at web link given under and in following written contents. -> Click on Start Menu and When it will appear then click in its vacant space. -> A popup menu will appear in which select personalize option. -> After that Color and Appearance windows will appear, select desire color. In this section , you can also perform task of color intensity and color mixer. -> At last click on Save Changes button to save the new settings. -> First method - Go to top edge of start menu, sign of mouse pointer will be changed in arrow then adjust size of start menu by dragging mouse. -> Second method - Use shortcut key Ctrl + Downward arrow key to decrease the height of Start menu with increase in its width. And use shortcut key Ctrl + Upward Arrow key to increase height of start menu with decrease in width.